Latest Government jobs application for all Indian through WBSTCL Recruitment 2018. Those who wants to work for West Bengal Government in India can apply for this recruitment process. There are various job profiles which are going to be filling up through this recruitment process. We explained about each job profiles and vacancies related to that job profile in the first table below. We personally took this information from the official PDF file published by the WBSETCL Department on their website. We always share the reference links under IMPORTANT LINK section related to each job profile. Those who are looking for the Government jobs in West Bengal can apply for this recruitment process. All fresher candidates are eligible to apply. More information about these Government jobs in India is given below in this article. 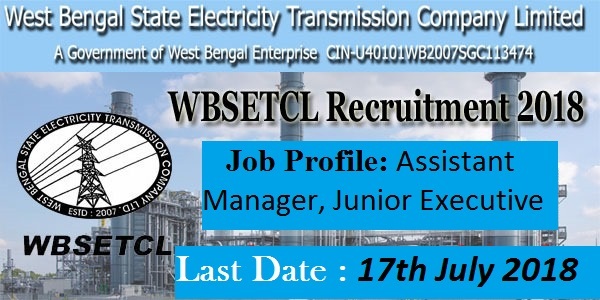 What are the Eligibility Criteria for applying this WBSETCL Recruitment? Those who have one year full time PG Diploma in Mass Communications / Public Relations / Journalism from Indian Institute of Mass Communication can also apply. The age between 18 to 27 years. One year PG Diploma in Logistics & Supply Chain Management ca apply these Government jobs. Indian candidates having 3 years diploma in Electrical Engineering from recognized Institute / College can apply these Government jobs. 8th Pass or equivalent plus Trade Certificate in ITI in one of the following trade: “Wireman / Electrician” can apply. Pay the Examination Fee through Debit Card(s) / Credit Card (s) / Internet Banking of all domestic banks & financial institution or Bank Challan on clicking on SBI Branch option. How to apply for these Government Jobs? Eligible candidates from India can apply for these Government jobs in WB. The procedure for applying these Government jobs is to apply online. The process for applying online will be end on 17th July 2018. You have to apply before this date. Candidates who are going to apply for these Government jobs will go through the written Examination after that Interview round for final selection. 17th July 2018 Last Date for apply online.